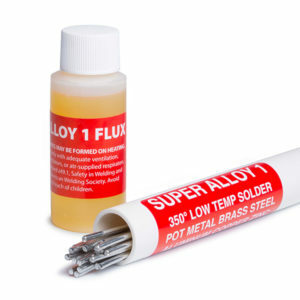 Super Alloy 1 multi -metal solder joins aluminum to galvanized steel at 350 degrees–with a bonding strength of 20,000 psi. 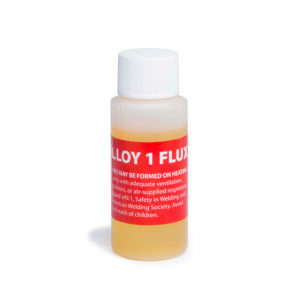 This low melting solder and flux work synergistically–just dip the rod into the flux and drip or paint the parent metal with the liquid flux. Super Alloy 1 works on aluminum, pot metal, zinc die cast, pewter, galvanized steel, copper, bronze, brass, monkey metal, lead, tin, zinc plated steel, and mild steel. You will see in the video that we add very little heat directly to the joint to be soldered, indirect heating works best with this alloy because of the low melting point.